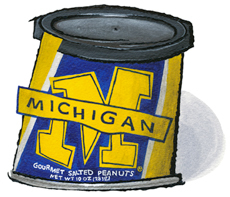 University of Michigan Peanuts for sale. Buy online at Zingerman's Mail Order. Gourmet Gifts. Food Gifts. Big, fat, perfectly cooked Virginia peanuts. I’ll go out on a limb and say they’re my favorite nut ever. Here we've got them two ways, packaged in a University of Michigan block "M" tin. The first way is straight-up salted. The second is coated in butter and sugar. The butter forms a crispy, caramel-like jacket and the sugar sweetens them just a little.